We’ve official confirmation of yesterday’s H7N9 report (see H7N9: Watching Guangdong Province) thanks to Biological on FluTrackers, who posted the following notice from the Emergency Management Office of Guangdong Province. November 22, 2015, Meizhou report province this winter's first H7N9 case, now designated admitted to hospital in Meizhou. 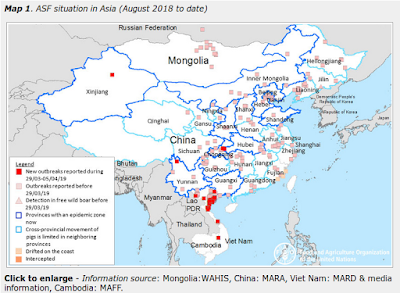 Experts assessed that: H7N9 epidemic is still sporadic (sporadic) cases mainly epidemic-prone period in January 2016 - appeared in February; live bird trade is active and has not implemented "fresh listing" focusing on prevention and control of urban areas the elderly, pregnant women, children, there is underlying disease in high-risk population groups. Experts advise: Do not touch live poultry citizen, can further reduce the risk of infection. After coming back from a live poultry market must wash their hands once a fever, headache, nasal congestion, cough, general malaise and other respiratory symptoms should seek immediate medical attention, and tell your doctor if there is history of exposure to live poultry market. Use a cutting board handling raw and cooked food should be separated, cut raw meat cutting boards must be scalded with boiling water, can be effective in preventing transmission of the virus or infection. After cooked poultry products are safe, safe to eat. While Hong Kong’s CHP has yet to post a notice regarding this case, Taiwan’s CDC has already posted a travel advisory. The Programme disease (Today 11 May 24 May) with the Chinese mainland health authorities confirmed, Meizhou City, Guangdong Province, the new 1 Example H7N9 flu confirmed cases, this case is the province today ( 2015 after the first case) in the autumn of H7N9 flu infection Source still be confirmed. Illness tube reminded, Taiwan and mainland China plans to travel to the area of the public, be sure to pay attention to personal hygiene, washing hands frequently to keep, avoid contact with poultry and cooked before eating habits to reduce the risk of infection. Illness tube Department said that the cases have occurred in the region Dabu high Beizhen 11 months 23 to 11 months 30 days the town fully closed poultry markets. Illness tube Guangdong Provincial Tourism Department announced that it will propose to upgrade to the epidemic warning ( Alert ) rating. Just this year, the Chinese mainland after autumn Zhejiang, Guangdong province have occurred H7N9 flu cases, so the two Provincial Tourism epidemic proposal as a warning ( Alert ), other provinces (excluding Hong Kong and Macao) as a note ( Watch ). Global since 2013, has so far accumulated in 682 cases, including the Chinese mainland 662 cases, Hong Kong 13 cases, Taiwan 4 cases, Canada 2 cases, Malaysia 1 cases, WHO on 11 May 13 update date 275 deaths. The Programme disease called people go to mainland China should be implemented hand-washing and other personal hygiene measures, and avoid contact with live poultry birds classes and access to markets; edible chickens, ducks, geese and eggs to be cooked to avoid infection. Such as when repatriation or flu symptoms of fever, should inform airline personnel and airport and port quarantine personnel; if these symptoms occur after repatriation, should wear face masks for medical treatment as soon as possible and inform the physician contact history and travel history. Information can be found in disease UNDCP website ( http://www.cdc.gov.tw ), or call toll-free vaccination Line 1922 (or 0800-001922 ) contact.